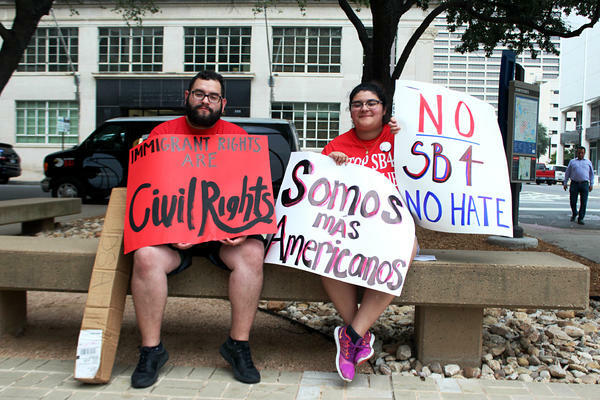 Hundreds of people marched through downtown Fort Worth to urge councilmembers to oppose SB4. 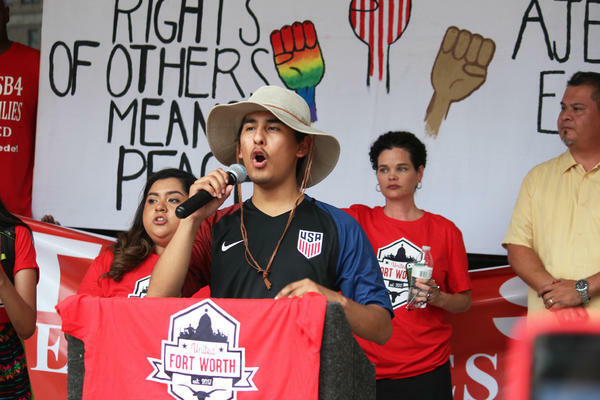 Daniel Garcia-Rodriguez founded United Fort Worth, which organized the demonstrations. Rudy and Briana Moreno, uncle and niece, say they're disappointed Fort Worth hasn't joined a lawsuit to stop SB4. 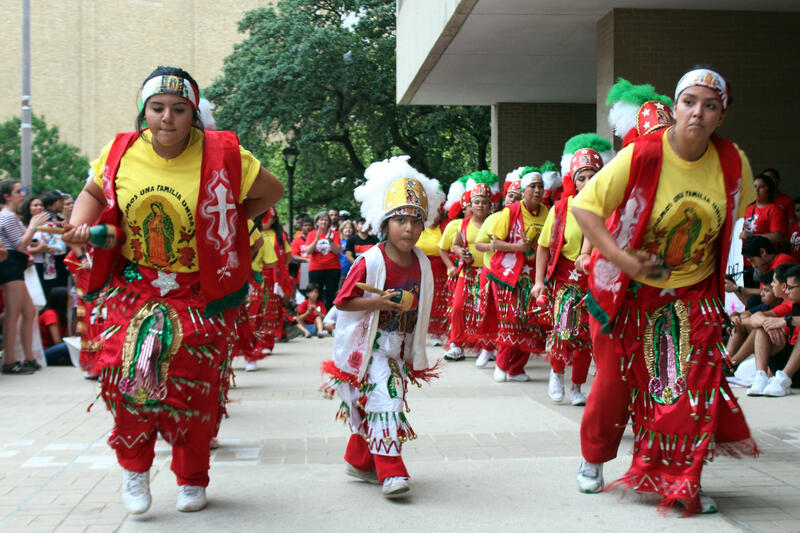 Matachines perofrmed a traditional dance venerating the Virgin de Guadalupe. The Fort Worth Police Department won’t fundamentally change the way it goes about policing the city when Senate Bill 4 gets implemented. The law banning so-called "sanctuary cities" won’t force them to become federal immigration agents. That’s what police officials told the Fort Worth City Council members Tuesday. But Assistant Police Chief Ed Kraus had bad news for the council at a briefing on the impact of the new law, which allows police officers to inquire a person’s legal status in the course of investigating crimes and when they detain or arrest someone. “Although Senate Bill 4 will not change the values of the Fort Worth Police Department, we recognize that this law may cause some strain between certain members of the community and local law enforcement,” Kraus said. Still, it looks unlikely that Fort Worth will join a lawsuit challenging the constitutionality of SB4. Led by the tiny border town of El Cenizo, all the biggest cities in Texas have joined the suit, but five of the nine Fort Worth council members said they don’t favor adding the city to that list. They did not take a formal vote, but members discussed their views during a council work session. Mayor Betsy Price emphasized that the law, slated to go into effect next month, will not force the police department to fundamentally change its community-oriented policing strategies. While the law would require the city to change its policy that prohibits officers from contacting federal immigration authorities, officers wouldn’t be forced to call the feds either. Councilwoman Ann Zadeh said that’s not enough. “While we as a city and we as a council and the police as an organization all might have the best intentions, there are many members of the community that I’ve been hearing from regularly about this that don’t feel safe in that respect and are very, very concerned about this,” Zadeh said. “SB4 is in violation of every civil rights amendment that is out there and how we don’t see that is beyond reason to me,” said councilwoman Kelly Allen Gray. Councilman Carlos Flores also came out in favor of joining the legal challenge, citing concerns about the law’s constitutionality. Councilman Cary Moon was one of the five members who opposed joining. He said it’s not worth spending city resources on a lawsuit that’s already underway. “For that judicial review to take place of SB4 forward, the city of Fort Worth does not have to join a lawsuit. SB4 can stand on its own without us deploying manpower and dollars to that movement,” Moon said. Also opposed to joining the lawsuit were councilmen Bryan Byrd and Jungus Jordan. Mayor Price did not explicitly state her position, but her staff clarified that she doesn’t think Fort Worth should be a part of the challenge. As the council briefing was coming to an end, hundreds of SB4 opponents were marching through downtown Fort Worth, part of a campaign to pressure the city to join the lawsuit, and force council members to take a formal vote. 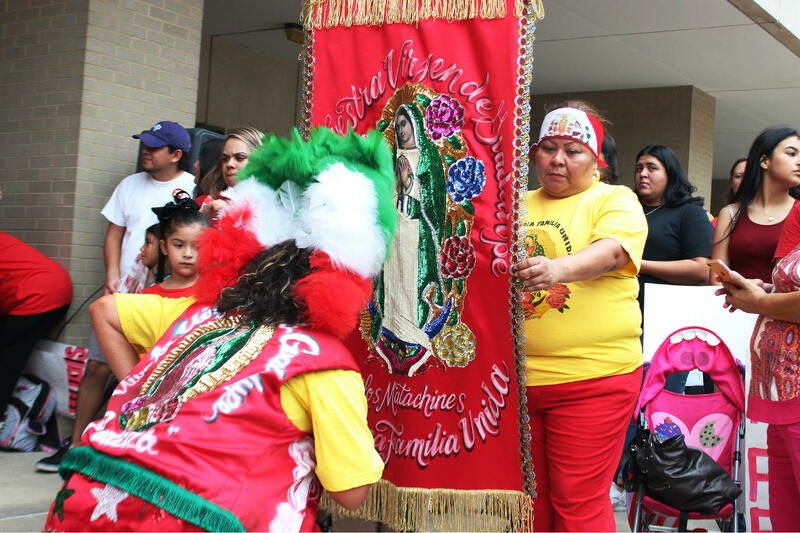 The coalition of community organizations, immigrant rights activists and faith leaders promised a day of action, and they delivered. 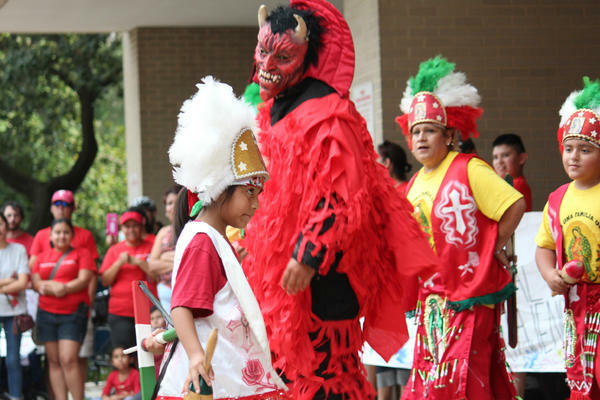 Hundreds of people in red shirts marched through downtown, chanting, cheering and drumming. At City Hall, matachines stomped and twirled, decked out in bright feathers and beads, in a traditional dance venerating the Virgin de Guadalupe. Speaking from a podium to an exuberant crowd, religious leaders denounced SB4 in moral terms. A rabbi said it’s intended to destroy communities. An imam said Fort Worth’s diversity is its strength and a priest prayed for City Council to oppose the law. Jacinto Ramos, a member of the Fort Worth school board, spoke in political terms. 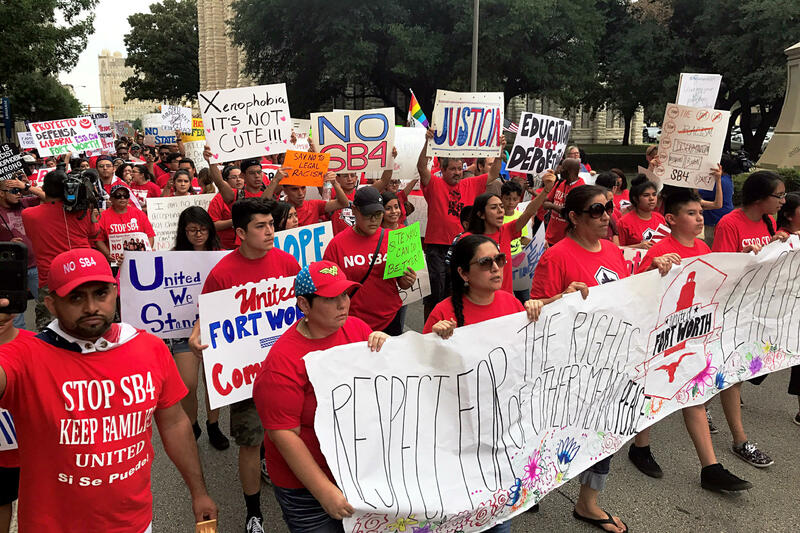 “The passage of SB4 reflects one thing: It’s a sickness of xenophobia and racism at the heart of our politics. It is a sickness that has infected the political leadership in our state, and the undeniable symptom is the passage of this discriminatory and exclusionary right wing law,” Ramos said. Rudy Moreno said he was disappointed by the council’s inaction. 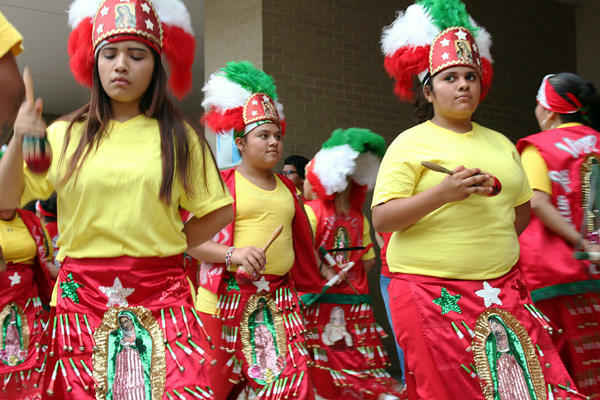 His immigrant family settled in Fort Worth – entrepreneurs he said, hard workers, tax payers. Still, some are undocumented, and they’re scared. “I have family members who won’t drive. They’re like, ‘Oh no, I’m not going to drive, I’m going to get pulled over. What am I going to do, what am I going to show them? I don’t have any documentation,’” he said, recounting conversations he’s had. Moreno said the fact that Fort Worth is still debating while every other big Texas city has joined the lawsuit makes him feel like his family doesn’t count in City Hall. CORRECTION: The radio story and an earlier version of the web story incorrectly identified Jacinto Ramos as president of the Fort Worth school board. He is a trustee, and no longer board president. Copyright 2017 KERA. To see more, visit KERA.